Fear can be a rather powerful force and even the bravest souls are shaken by something. 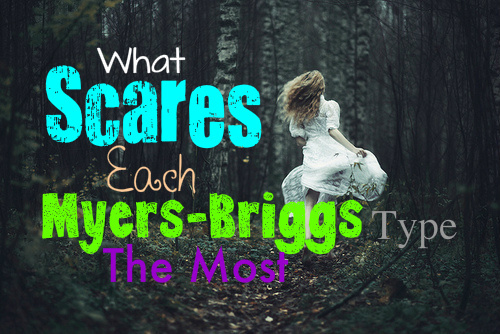 Here are a few things that we believe each Myers-Briggs type might be afraid of. INFJs are highly compassionate individuals and because of this they are rather connected to the world around them. INFJs are often afraid of the harm and evil that people in this world are capable of. They are also somewhat afraid of their own darkness and the harm it can cause to those that they love. They are not under the misconception that they are pure light, and their awareness makes them somewhat fearful of their own capability for harm. The inner workings of an INFJs mind can often be the most fearful thing for them. That and phone calls…they really don’t enjoy phone calls. ENFJs are very skilled at maintaining balance and a sense of control in their lives, which makes the fear of losing control rather great. ENFJs would despise being incapable of solving the problems in their lives and would never want to be rendered helpless. ENFJs fear not being able to find answers to the big questions and losing their independence would truly terrify them. Losing connection with the people they love most is something that the ENFJ is often fearful of. INFPs have rather vivid imaginations which means they might have a long list of fears. One of their biggest fears is that they won’t be able to accomplish their larger goals in life. INFPs believe in having a bigger purpose and they want to be able to fulfill theirs. They are often very afraid that they may not be able to do something great with their lives, which is something that can keep them up at night. Although, INFPs are introverts they do fear the idea of being alone in a greater sense. They want to find people to share their hearts with, and they are afraid of never finding that. ENFPs are often afraid of being unable to find passion in their lives. They hate the idea of monotony and want to be able to gain excitement in their lives. Because of this ENFPs may be somewhat afraid of commitment, because it can often hold them back from opportunity. ENFPs actually care quite a bit what others think of them and may fear rejection or being disliked by those closest to them. They want to feel connected to their loved ones, so the ENFP might be afraid of losing those people. INTPs may fear the idea of success and failure simultaneously. They have probably spent their entire lives with people telling them just how much “potential” they have, which can put a lot of pressure on them to succeed. INTPs are extremely logic minded individuals but they also care very deeply about the people closest to them. This can sometimes put a lot of pressure on them, which might cause them a lot of fear. Fearing rejection is actually a surprising but true fear of INTPs, which can cause them to live more inside their shell. ENTPs are extremely active individuals who enjoy being able to keep excitement in their lives. They often fear the thought that making one decision might hold them back from opportunities. This can cause the ENTP to become fearful of commitment, since that relates to their fear of missing out. ENTPs fear the idea of having their freedom and personal choices being taken away from them. They want to be able to think openly without having people hold them back from this. Poor health can sometimes be a fear of ENTPs since they want to be capable of being independent and caring for themselves. INTJs often have a fear of being useless and unable to accomplish their goals. They thrive on knowledge which can sometimes cause them to be concerned that they may not know enough. They never want to be considered ignorant and always want to be able to answer any questions presented to them. INTJs may fear a lack of control in their lives, which is why they strive to understand everything around them. ENTJs may experience a fear of being misunderstood by those around them. ENTJs often appear fearless to others, because that is their intention. They want to be able to control their environment and often do not allow most people to see what their greatest fears actually are. They often do not let people in because they do not want to be misunderstood or taken advantage of. Many ENTJs fear being abandoned and that is why they favor loyalty so much in the people they care for. ISFJs often have a powerful fear of losing the people closest to them. They may even try to hold these people too close because they do not want something bad to happen to them. When an ISFJ is stressed they might begin to envision the worst possible scenarios, which makes them afraid of something bad happening. This might make them hover over their loved ones, but it is simply because they want to keep them safe. The greatest fear of most ESFJs is being abandoned by the people that they love most. They care very much for their loved ones, which often causes them to become terrified of being left by them. They might be afraid of not being good enough for others, causing them to scramble to prove themselves at all times. This can cause perfectionist tendencies in the ESFJ, as a way to protect themselves from being left by the people they love. ISTJs are often afraid of failure, because they want to be seen as competent by those around them. ISTJs work very hard to be successful in all aspects of their lives, which makes them afraid of being misunderstood. They want people to be able to see how hard they try and just how capable they are. ISTJs also fear a lack of security in their lives and that is why they attempt to control their environment. They want to feel safe and in control of the things around them. ESTJs are often more afraid of failure than they are anything else. They are strong individuals who want the people around them to view them as competent and capable. ESTJs want to be able to solve any problem that they are faced with and are often afraid that they might not be able to do this. Their need to be strong and efficient can cause the ESTJ a lot of fear when it comes to failure. ISTPs are very confident and independent individuals, which can make them appear rather fearless to others. Even the adventurous ISTP has things that they are afraid of, and this is often tied to a lack of control. ISTPs do not want to lose their independence, which can make them afraid of being seriously injured or sick. They do not want to be in a situation where they cannot take care of themselves and are forced to rely on others to tend to their needs. Losing independence is a rather scary possibility for ISTPs. ESTPs are very strong-willed and adventurous individuals, which much like their introverted counterparts can cause them to appear fearless. ESTPs often possess a fear of being abandoned or being alone. They enjoy being around others and might be rather picky about who they let into their personal worlds. When and ESTP lets someone in they can become quickly afraid that this person might abandon them. They may not fear things like spiders or snakes, but their fears run much deeper and are more connected to loneliness. ISFPs are often afraid of being thrown into situations they are not comfortable with. They enjoy their own privacy and being forced to do something is rather scary to an ISFP. They are rather unique individuals which leads them to be afraid of some rather odd things, like mannequins or even throwing up. These idiosyncrasies are what makes ISFPs so very special. The things they often fear the most is being a failure, or not being someone who lives up to their full potential in life. ESFPs are very fun-loving and exciting individuals who are more than willing to take risks in life. Their adventurous nature makes them appear fearless, but that is simply not the case. ESFPs often have a fear of being abandoned, and simply want to remain connected to their loved ones. They don’t want to be held back or forced to do something that they dislike, so being controlled can often be a fear of theirs as well.